Four score and seven years ago—wait, no, just four years ago—we brought forth into this world a crying baby boy. And by we I mean my husband and I as well as the doctor and her medical team; my sister, who provided physical and emotional support; and God, showing up in the details small and enormous. We brought forth a baby, because he wasn't willing to make his own exit from his watery nest. Four years feels like ten most of the time. How do I remember the baby so needy when my son stands before me independently wanting to do so much on his own? Four years feels like a mere couple of weeks some of the time. How can I forget the worry that he wouldn't figure out how to nurse, the excitement when he first rolled over, the joy at his baby giggles? This boy, ready to be big and ride his new bike but still wanting to be small when he crawls in my lap for a story or for comfort when he's sad. This boy, so tall, so ready to race out of my sight as he has fun with friends but still clinging to my hand when he falls asleep, making sure I stay as long as he can get me to. What a journey from wish to real live child! Our home before had no marbles rolling across the carpet, no Hot Wheels on the dining room table, no wooden blocks balancing in towers in the living room. Now we can't imagine a room without some sign of the child who lives here. A sticker on the wall, a stuffed animal in our bed, a drawing on the refrigerator door. The years will continue and the signs will change, as they already have, with pacifiers and teething rings and burp rags already hidden away. But for now we celebrate today. 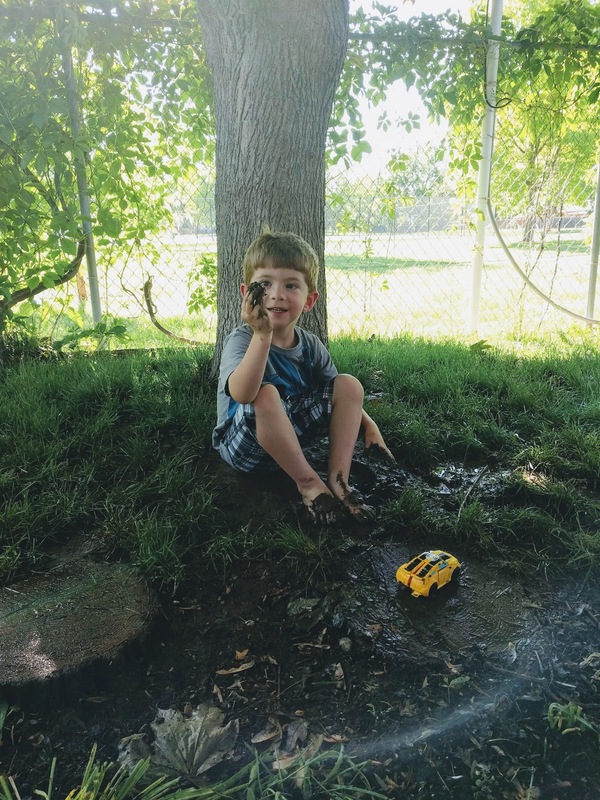 We celebrate in mud between toes and cake between fingers, friends flashing smiles and family sharing hugs. Balloons, new toys, and ice cream sandwiches. Batman, fierce, crouching on top of the birthday cake. Today we celebrate the boy: four years strong, four years wise, four years ours to love. "Daddy, is That a Dang it?" Parents worry about a lot when that first cry awakens them in the night, when the toddler takes her first steps and stumbles, when the five-year-old smashes his face from falling off his bike. They worry that something is worse than it is. They sigh in relief when the moment passes and their child is OK, all patched up in Batman bandaids or soothed to sleep again with a pacifier. They settle down to sleep at night, thankful that their child has made it through another day without catastrophe, or in spite of it. But then, if any parents out there are like me, they might lie awake at night wondering how their great and healthy kid might still get hurt or sick the next day or, even worse, how they might be screwing up as parents, causing irreparable damage by cursing in front of their little cherub. In this family, choice words sometimes come out of our child's mouth and they can most certainly be blamed on me. It isn't that Luke never cusses—he's not that squeaky clean—but with Mommy home all day carrying on with all the duties of house and child, she (I mean I) can sometimes let slip a taboo word or two. You'll laugh when I share what those words are, but, let me tell you, when I was a child the only expletives that were OK to use—because they didn't count as expletives—were made-up ones or those of the "shoot!" or "rats!" variety. Fortunately, Geddy's first word in life was "more" followed by other G-rated words like "ball," "go," and "hot." Oh, and "Mama" and "Dada." As I weekly added to the list of words he was saying (I stopped doing this by the time he was two because it was hard to keep up! ), they remained on the safe side, though we had to be careful to explain to others what he said for "cup," and "cracker." From age three to now, however, it has been common to hear "What the heck?!" and "Dang it!" come out of Geddy's mouth. I could paint myself in a positive light by chiming in with, "Hey, at least I didn't say the other words in front of him!" but I think that's really just a way of patting myself on the back for the fact that I did a better job of whispering those so Geddy wouldn't hear. While you laugh, let me add that it is entirely possible that "crap" will be the next word in his vocabulary. Send me some soap to wash out my mouth, but in the mean time get one last chuckle at my expense. The first time Geddy used one of these words from Mommy in front of Daddy he asked, in all seriousness and with great curiosity, "Daddy, is that a dang it?" Perhaps he'd been wondering for some time just what it was that Mommy was always talking about. Maybe at last he had solved the mystery and could identify a dang it. Luke laughed too hard to help poor Geddy out, so he may never know the answer.